Like to listen to music on the go? Explore the Libraries' streaming audio databases. The Libraries offer several databases which feature streaming audio, in a wide variety of musical styles. One easy way to find these is the click on the "E-Resources" tab from the main Library Web page, and then select "E-Music". You can also search under the "Databases" search tab on Library Web, by the title of any individual database listed below. You can listen to streaming content from these databases from any computer with audio in the Libraries or on-campus, or from off-campus (via UNI login). Note that many of these databases offer a choice of bitrates for listening – choose the highest, whenever possible, for better audio quality! You'll often see this option in the pop-up player window which launches when you play a track. It's not always set to the highest setting. You'll also find results in CLIO, for content in Naxos Music Library and Classical Music Library (including the jazz collections). This is convenient because you can search for music in CLIO and see both sound recordings available in the Libraries, and streaming audio content available. You can launch playback directly from within the CLIO record. Note, however, that the records for this content are loaded in periodically to CLIO, not continuously, so the most up-to-date search for the content of any particular database is through that database's search function. Get to know the streaming audio databases, and let us know what you think! 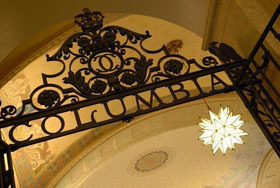 Comments, questions, problems can be sent to musiclibrary@columbia.edu. 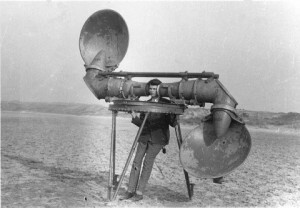 Note: the listening device pictured above is for illustrational purposes only. Professional listener in a controlled space. The Libraries do not recommend the use of such a device for home and/or unsupervised use. This entry was posted in Databases, Music, News and tagged Databases, Music on February 23, 2012 by Nick Patterson.